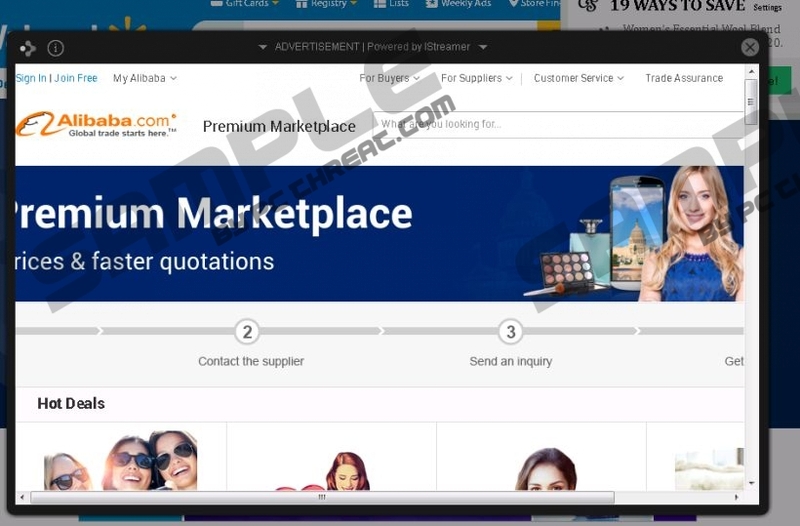 Istreamer is purely an advertising-supported application because it slithers onto computers in order only to show commercial advertisements, and it does not even try to convince computer users that it is going to act in a beneficial way. Many users do not even know that they have this undesirable program installed until it starts showing commercial advertisements, because it does not have a graphic interface. If you have already noticed the presence of this program or started seeing its ads on your screen, you should eliminate it as soon as possible. We do not recommend keeping this software installed because it might cause harm to your system one day. Even though the program itself is not harmful, it generates and displays untrustworthy ads on a user’s screen. You can get rid of them by deleting Istreamer. In order to find out whether this program is really responsible for all those ads, you should check the %ALLUSERSPROFILE% directory because Istreamer is always installed there. In addition, it is worth checking the Task Manager because it adds a process istreamer.exe to the list of processes. If you are sure that Istreamer is responsible for all those advertisements, you should remove it as soon as possible. In the meantime, ignore all those advertisements because you might end up on a corrupted website and even download malicious applications. Our specialists say that this program might perform other activities, too; e.g., it will connect to the Internet without permission and it will track your online activities. As can be seen, it is definitely not a program which you should keep installed on your system. If the Istreamer advertising-supported application has slithered onto your computer, it is very likely that other undesirable programs have managed to enter your system, too. Yes, Istreamer travels bundled with malicious software, but it is not the only one that acts in this matter. Specialists working at pcthreat.com have noticed that programs identical to Istreamer also exist, e.g., LolliKey, PrintOnKey, and FlashBeat. If you ever detect any of them on your system, remove them right away. If you want to make sure that malware cannot enter your system, you should install a security application and keep it enabled. Your tool must be trustworthy if you want to protect your system. Not all undesirable programs can be removed easily. Luckily, Istreamer is not one of those. It is easy to remove this adware program because it can be erased via Control Panel. In order to make this process easier for you, we have prepared the instructions below; you should follow them in order to fully remove Istreamer. Of course, there is a possibility that our instructions will not help you. Luckily, there are various antimalware tools available, which means that you can simply scan your system with an antimalware tool in order to remove existing infections from your PC. Select the undesirable program and click Remove. Tap the Windows key + R simultaneously. Enter control panel in the box and click OK.
Quick & tested solution for Istreamer removal.